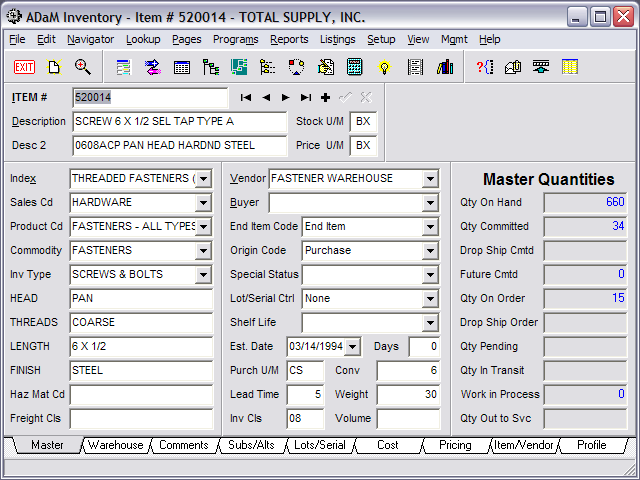 Inventory management for distributors is critical to controlling their most important asset. Inventory quantities must be accurate. Re-order calculations should minimize inventory investment but keep customer service levels high. 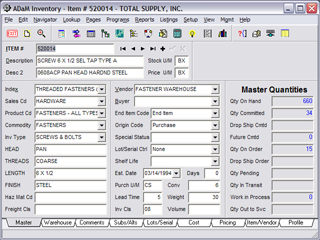 Flexible controls, detailed costing, and product coding provide for unique and complete product information. With real-time interface to other ADaM systems, the ADaM Inventory Control system provides all of this and complete integration. Inventory turns are up. A/R Days Sales Outstanding are down. Cash flow is good and our bottom line is where we budgeted. We can measure productivity in all aspects of our business, even some we thought to be immeasurable.